IFA President Eddie Downey and IFA National Livestock chairman Henry Burns lock some trollies. Over 500 IFA members protested last week at Tesco in Naas Co Kildare. 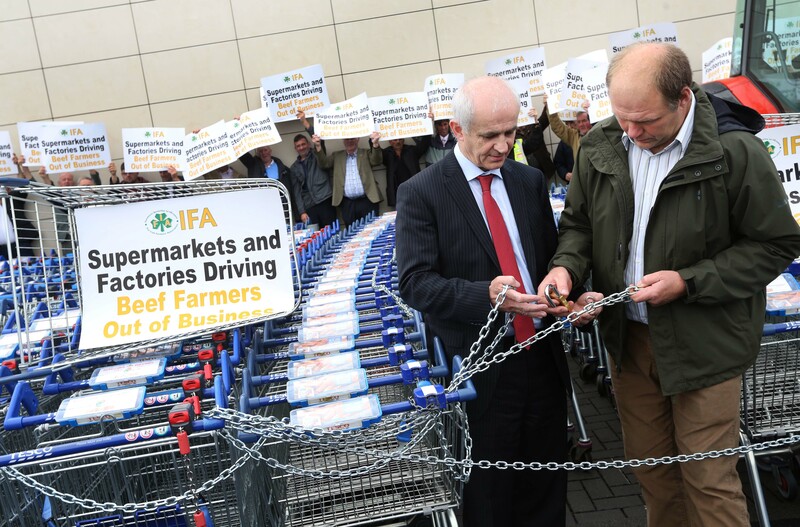 At the latest IFA beef farmers’ protest, involving over 50 tractors outside the Lidl supermarket in Ballinasloe, Co. Galway, IFA President Eddie Downey said livestock farmers are intensifying their campaign against the price and specification cuts imposed by retailers and factories. The IFA President said farmers feel betrayed by the unacceptable behaviour and lack of corporate responsibility on the part of the powerful retailers and meat factories to their farmer suppliers. Eddie Downey warned all of the major retailers including SuperValu, Dunnes, Tesco, Aldi and Lidl, and the factories that the anger and frustration of farmers is at boiling point and the unjustified price and specification cuts, which are severely damaging farmers and the Irish beef sector, must be reversed. The IFA President said Teagasc has confirmed that livestock farmers’ incomes were down by 13% to 22% last year, at extremely low levels from €9,469 to €15,595. He said “With beef prices in our main markets in the UK and across the EU stable and recovering, the current attack on prices led by the factories cannot be justified. Eddie Downey said IFA met with the Minister for Agriculture Simon Coveney this week on the beef crisis. The IFA leader said the Minister outlined that he will get directly involved and will play a central role in discussions between factories and farmers to resolve the current problems. The Minister said he expects the processing industry to respond positively to the key issues around the Quality Payment System and specifications to suit the Irish beef sector. He said that Minister Coveney must assert his authority with the factories and demand that they respect the agreement they entered into with farmers on the price grid under the Quality Payment System. He said the Minister must insist that the factories remove the unfair specifications cuts on dual pricing, weights, age and breeds that were never part of the QPS. The Livestock leader said farmers expect Minister Coveney to take a much more hands-on approach in tackling the issues that are negatively impacting on their incomes. “The Minister must ensure that there is strong competition and transparency in the beef sector. Cattle prices must fairly reflect market returns. We need a strong live export trade to keep a balance in supplies and support viable prices.” He said this move by the Minister is significant and must deliver real results for farmers. IFA National Livestock Chairman, Henry Burns said contracts from the factories at viable price level are essential and especially for the higher cost winter finishing and bull beef systems. Henry Burns said IFA has been working hard with processors in Northern Ireland to try to resolve the problems impeding the live trade to the North. “We worked to put forward branding solutions and these have now been approved by the Department of Agriculture in the North.” He added Ministers Simon Coveney and Michelle O’Neill cannot allow the supermarkets to reject these labels, which are mandatory under EU regulations. In addition, Henry Burns said Minister Coveney must deliver the CAP direct payments early this year on October 16 and ensure full funding in Budget to provide for a GLAS payment for 30,000 farmers. The IFA livestock leader said restoring confidence at farm level is critical and again called on the factories and their retail clients to reverse the unjustified price cuts. Henry Burns said Minister Coveney must stand up for farmers and his Beef Forum must deliver on the key issues now.